Request a free consultation with no obligation. We provide friendly, professional advice to suit your requirements. To arrange a visit or to request further information, use our online enquiry form or simply give us a call on 01355 261657. 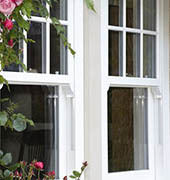 Sash windows Scotland are Scotland’s leading manufacturer of the market’s premium uPVC sash window, the Rehau Heritage. Combining all the benefits of a modern day uPVC window with the aesthetics of a traditional timber sash window means retaining the charm of your home’s appearance while gaining low maintenance, energy efficient double or triple glazed windows that will stand the test of time for many decades to come. The smooth operation and triple draughtproof seals mean any size of sash window will bring a lot more comfort and satisfaction to your home. 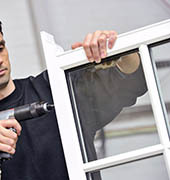 As a trade supplier, we have been manufacturing Rehau sash windows at our East Kilbride factory since 2002 and now offer our domestic installation service to homeowners. We can compete on price with the many sales driven double glazing companies offering an inferior product as we do not employ any salesmen, you deal directly with the owners of this long standing family business. So you get our best price the first time without the haggling that is notorious in our industry. Most uPVC sash windows have plant on spring loaded horns attached to the top sash. We are Scotlands only manufacturer of the new Rehau run through sash horn, which along with the slim sash profile and our new grained foil option gives the look of a traditional sash window that really does put all our competitors firmly in the shade. We firmly believe you will not find a better sash window anywhere. 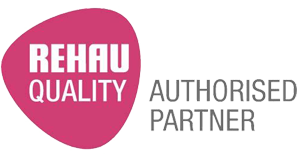 We offer a full 10-year guarantee on all of our Rehau Sash Windows, ensuring peace of mind for all of our customers.